Flash Xiaomi Redmi 1S Bootloop or Brciked Easily - Hello everyone, dear AnyIndo visitors. In this chance we're going to discussing about a nice Android phone, this Android phone was made by Xiaomi. How to flash Xiaomi Redmi 1S is a powerful way or method to fix hardbrick or bootloopon Redmi 1S. If you ask us, why Xiaomi Redmi 1S getting bootloop and hardbrick, usually it causes because there are damage system on your Redmi 1S such when you ever root your phone or because the other problems. Flash Redmi 1S need to do because your phone just stuck on logo or always goes to Recovery mode, can't turn on normally. There are many methods to fix this problems, and something or we can say the last method to handle this is by using flash. Some Android users flash Redmi 1S via Fastboot application, because flash Redmi 1S Fastboot is easier. Yes, flash Redmi 1S using Fastboot is the easiest method, we should guide you by using Fastboot in different articles. Then the others prefer to flash Redmi 1S usin PC, they flash Redmi 1S using Mi PC suite if they think flash Redmi 1S using fastboot is not their interest or they may have a PC. Download Redmi 1S ROM, we've provided the link in this article. Download MiPhone Tool, we've provided the link in this article. Download USB Driver, we've provided the link in this article. Once you've downloaded all file above, extract Xiaomi Redmi 1S ROM and put inside the folder where you can remember it easily. Install USB Driver and install MiPhone on your PC. 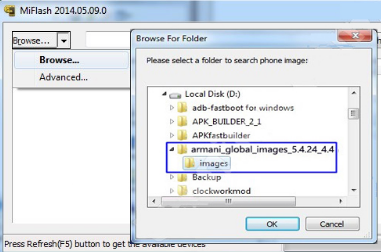 After MiFlash open, click on the Browse to find out armani_global_images_5.4.24__4.4 folder you've extracted before. Select on the images folder and then click OK.
Go to Fastboot mode on your Redmi 1S by pressing volume down + power button simultaneusly. Next, plug your Redmi 1S to PC via USB Cable. On MiFlash tool, click refresh to detect it is connected or not.Once it is connected, there will appear the code on the Device column. Click Flash button and then flashing process for your Redmi 1S will run automatically,just wait until the process finish. Once flashing process finish, your Redmi 1S will restart automatically and booting the system, if it stops on logo just go to Recovery mode by pressing volume up and power button simultaneously then select Wipedata/cache/dalvikcache. Thus enough the tutorial about How to Flash Xiaomi 1S redmi , we hope this tutorialwould be useful for you. Thank you for visiting AnyIndo and also read our the articles on AnyIndo. 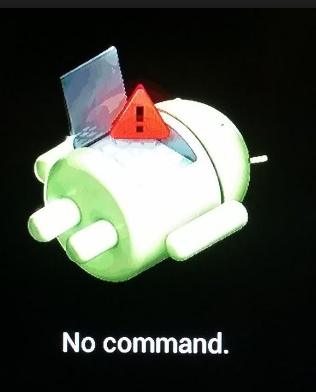 Belum ada tanggapan untuk "Flash Xiaomi Redmi 1S Bootloop or Brciked Easily"